Sea of Thieves - Sea of Thieves Year One By the Numbers! 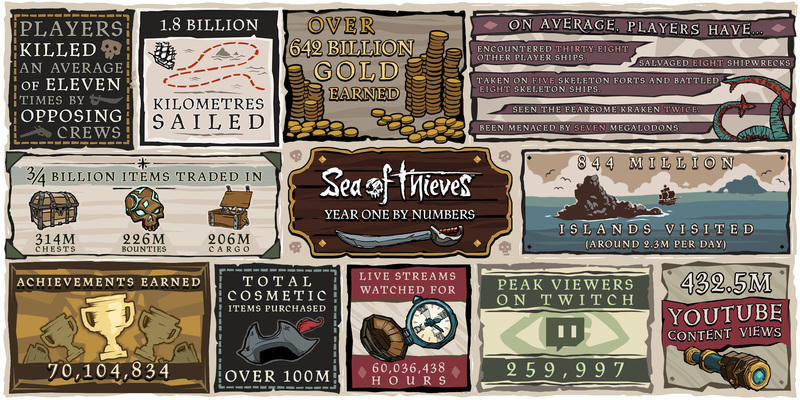 With a new golden age of Sea of Thieves about to begin when the recently announced Anniversary Update is released into the wild, we thought this would be the perfect time to share a few numbers and milestones from our first year. 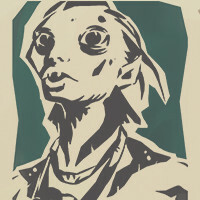 We're not only grateful for all the support that has seen so many players set sail in Sea of Thieves – we're humbled and inspired by it. To each and every one of you who's played the game, we'd like to say thank you for making Sea of Thieves' first year such a memorable one. Those players have certainly been busy when they've been on the seas, collecting and cashing in almost 750,000,000 chests, skulls and items of cargo to amass a collective fortune of 642,000,000,000 gold! We'd also like to say a big thank you to the streamers and creators who've shared our game across Mixer, Twitch and YouTube. It's staggering that the game has racked up more than 6,500 years of viewing on live stream platforms while also generating more than 400M views on YouTube. It's been inspiring to watch the creator community embrace the game and create their own memorable stories that can captivate an audience. This is still just the start – there's plenty more to come from Sea of Thieves. Here's to an even better Year Two!